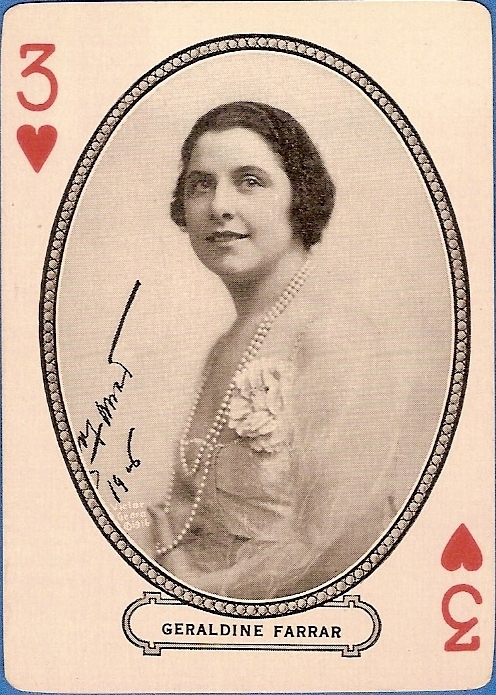 Geraldine Farrar is the only Metropolitan Opera star in the M.J. Moriarty deck. 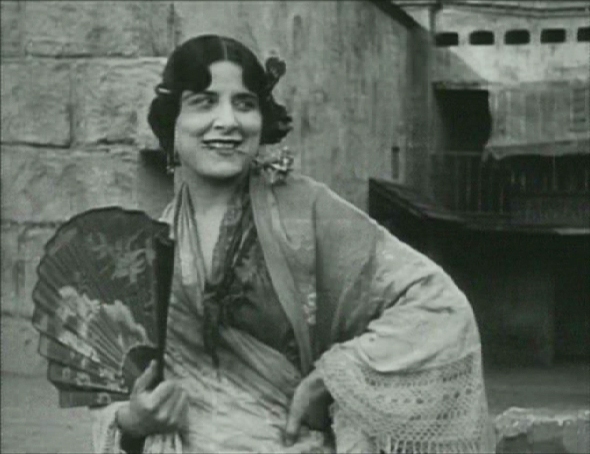 Other great singers would make the transition from Met to movies, but not until the sound era; and while some (Lawrence Tibbett, Grace Moore, Lily Pons) would be more successful than others (Luciano Pavarotti), only Geraldine Farrar managed to become a movie star without ever once depending upon her voice to get her there. No wonder. She was a natural actress without a trace of self-consciousness, and the camera loved loved loved her. The picture on the card isn’t the most flattering, with that hairstyle like a leather aviator’s helmet, but you can see what I mean, especially with those enormous, all-seeing eyes — they make you want to glance over your right shoulder to see what she finds so fascinating and amusing; not even that huge corsage can pull your attention away from her eyes for very long. Here’s another look at those eyes, this time smoldering and looking straight into your own. The portrait is by the German painter Friedrich August von Kaulbach (1850-1920), and is now part of the Geraldine Farrar Collection in the Music Division of the Library of Congress. It was probably painted in late 1901 or early ’02, about the time the 19-year-old Geraldine created a sensation as Marguerite in Gounod’s Faust and became the toast of Berlin. That Berlin triumph was the culmination of a course of study that had taken her from her birth in 1882 in Melrose, Massachusetts — where she determined at an early age to become an opera star — through voice study in Boston, New York, Paris, and finally Berlin, where her big splash in Faust brought her under the tutelage of the great soprano Lilli Lehmann. She remained with Berlin’s Royal Court Opera for several seasons and became a favorite of the Kaiser and his family; there were scandalous rumors of an affair with Crown Prince Wilhelm which Farrar’s family and friends (protesting too much?) were at great pains to deny. 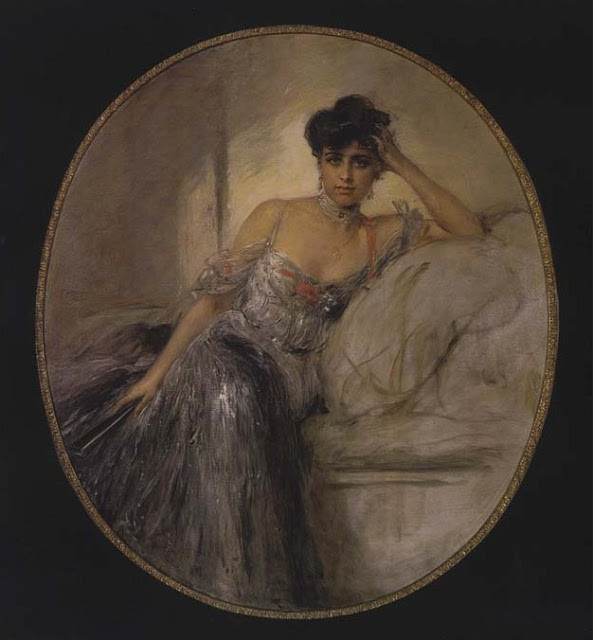 Berlin was the springboard to a brilliant European career — Monte Carlo, Stockholm, Paris, Munich, Warsaw — that brought her home to America and the Metropolitan Opera in 1906. Geraldine Farrar was perhaps the world’s first multimedia star — if only because for the first time in history, a performer could have more than one medium to be a star in. Besides her dazzling success on the opera stage and recital circuit, she made over 200 recordings for the Victor Talking Machine Company; you can still hear plenty of them on YouTube. And then, in 1915, yet another medium; the movies came calling, in the form of Cecil B. DeMille and the Jesse L. Lasky Feature Play Company. Lasky and DeMille had been making a go of their moving picture venture out in sleepy Hollywood, shooting in a converted barn at the corner of Vine and Selma Streets. I don’t know what prompted them to approach Farrar; perhaps they read the interview where she described herself not as a singer but “an actress who happens to be appearing in opera” and figured an actress in any other vehicle… Whatever the impetus, it was a masterstroke. Farrar agreed to work eight weeks during the Met’s off season, making three pictures for a fee of $35,000. The news, and the announcement that the diva’s first picture would be a silent version of her Met success Carmen, electrified the industry. The William Fox Co. was inspired to do a quickie knockoff with their house vamp Theda Bara (Fox’s picture went into release the day after DeMille’s Carmen but doesn’t seem to have cut very deeply into its business). 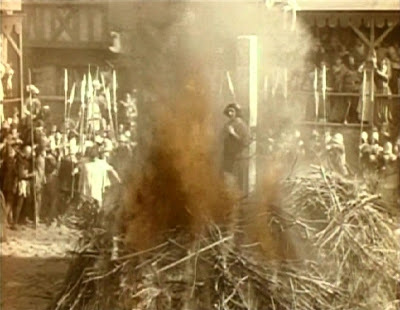 The DeMille-Lasky Carmen wasn’t planned as an adaptation of the opera; the work was still under copyright, and the proprietors wanted too much for the movie rights. 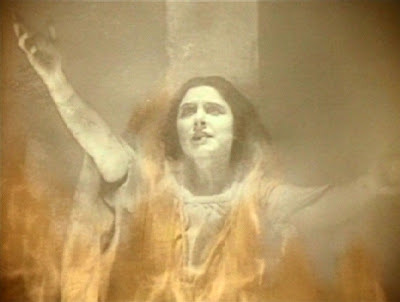 Instead, DeMille and his scriptwriter brother William turned to Prosper Merimee’s original story, now in the public domain, which had a story much changed in the opera. Still, the opera was too familiar to ignore completely, so a musical score was commissioned adapting Bizet’s themes (Lasky could afford that much). Before shooting on their big-money title, though, DeMille made a canny decision: he would shoot Farrar’s other two pictures (Temptation and Maria Rosa) first, just in case his leading lady needed a little experience to put her at ease in front of the camera. This was probably prudent, but it proved to be unnecessary; Geraldine Farrar took to movies like a duck to water. Here she is in Carmen’s classic pose — a cliche by now, but at that time you could hardly get away with leaving it out — the rose clenched in her teeth, lasciviously eying the unfortunate Don Jose (Wallace Reid), whom she intends to seduce to help her smuggler cohorts. Carmen was a big hit for the Lasky Co., in both money and prestige. Not since the aging Sarah Bernardt hobbled around on her wooden leg in Queen Elizabeth had a star of such international magnitude graced a movie screen. And it must be said, whatever the Great Sarah’s power on stage, she had hardly a tenth of Farrar’s instinctive understanding of movie acting. By the time the picture was released — on October 31, 1915 — Farrar had returned to the Met; the other pictures she had shot that summer were spaced out for release the rest of the season, Temptation at the end of December and Maria Rosa at the beginning of May 1916. 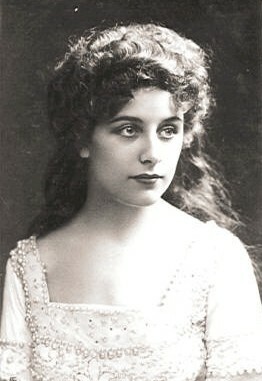 Farrar enjoyed her eight week stint in Hollywood, where every man and woman in the Lasky Co. was completely won over by her professionalism and her down-to-earth personal charm; people used to gather outside the window of her dressing room and listen to her sing as she prepared to go on the set. 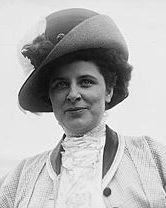 Between pictures she met the handsome actor Lou Tellegen, whom she married in February 1916. That following summer, with the Met again going dark, she was back at the Lasky Studio, again working for DeMille. The Woman God Forgot wasn’t released until 1917; the big money picture for ’16 was Joan the Woman. DeMille and Macpherson drew a direct parallel between the Hundred Years War and the war then raging in Europe, telling the story of Joan’s battle for France within a framing story of an English officer in the trenches of the Great War (also played by Wallace Reid) who takes heart from Joan’s devotion (and attains a similar shall-not-have-died-in-vain martyrdom under the barbed wire). This publicity still was presumably approved for release by DeMille and Lasky, but unfortunately it isn’t terribly becoming to Ms. Farrar; granted, she was some years over-age (and some pounds overweight) for the role, but in the finished picture she never looks quite as tomboy-silly as she does here. In fact, it was in working on Joan the Woman that Farrar demonstrated the quality that DeMille, throughout his career, would especially prize among his actors: absolute fearlessness. Well, not absolute; she was actually afraid of horses and had to be doubled in many of her riding scenes. 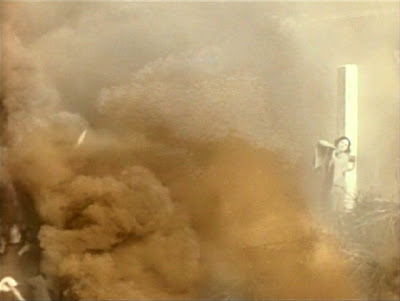 But fearless nevertheless; you can see it in the battle scenes, as she strides resolutely in full armor (only without that dear little pleated skirt) among the flailing swords, maces and pikestaffs. Alas, the honeymoon with Lasky and DeMille did not last, chiefly because of the honeymoon with Lou Tellegen. 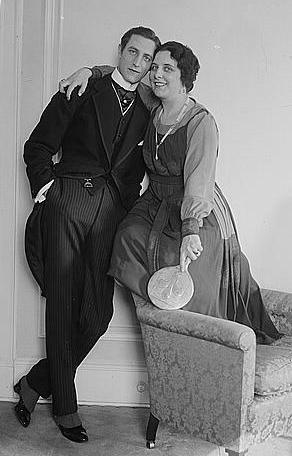 The Dutch-born Tellegen had come to America in 1910 at 29, as leading man (and offstage consort) to Sarah Bernhardt. After marrying Farrar in 1916, when she returned to Hollywood he began throwing his weight around and interfering in her films. To keep him out of their hair (and hers), DeMille and Lasky allowed him to direct a picture, What Money Can’t Buy. When they judged that one to be a dog — along with another, The Things We Love — Tellegen got his nose bent out of shape, and Farrar (out of what she later ruefully called “wifely loyalty”) sided with him. Both of them left the Lasky Co. and signed with Samuel Goldwyn. Working her customary off-season shifts, Farrar made six pictures for Goldwyn (three co-starring Tellegen). When Goldwyn complained that her pictures were not doing well, she suggested (with no hard feelings) that they cancel the remaining two years of her contract. She left movies for good in 1920 (by that time she’d been replaced by Cleo Madison in the M.J. Moriarty deck) and returned to the Metropolitan Opera, where she retired amid great fanfare in 1922 at the age of 40. Now that’s a bitter divorce. What might have been if Geraldine Farrar had not joined in Lou Tellegen’s falling-out with Cecil B. DeMille is a tantalizing question mark. Even more tantalizing is the thought of how her career might have gone if she’d been born 20 years later, if she had made that hit in Berlin in 1921 instead of 1901. 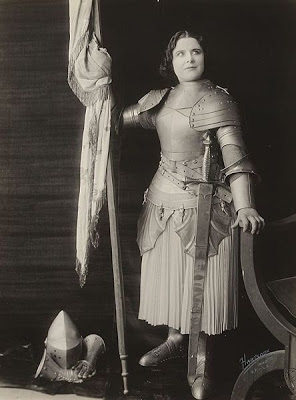 Then, when Hollywood went ransacking New York for musical talent during the sound revolution, she would have been about the age she is here, when she appeared in the article “The Muses of Movie-Land” in the June 1918 issue of Motion Picture Magazine, as Euterpe, Muse of Music. Jeanette MacDonald and Irene Dunne, among others, may have had reason to be grateful that they never had to deal with the competition. The determination, hard work and self-confidence of a little girl who decided before age 10 that she would be a great opera star served Geraldine Farrar well through a long and healthy life. After retiring from the Met, she continued on the concert stage until 1931, and appeared in a 1926 Franz Lehar operetta, Romany Love, that closed after one performance. From there she made occasional appearances on the radio, published her autobiography (Such Sweet Compulsion) in 1938, and served as a Red Cross Volunteer during World War II. She lived in comfortable retirement in Ridgefield, Connecticut as the well-loved Dowager Queen of American Opera until her death on March 11, 1967. She was 85.